I've been away from the blog for a long time, and, with renewed excitement, I'm back. This is a modest start - just a humble supper of shrimp ceviche, roasted potatoes, and caprese salad made with cherry tomatoes (it was off-season for vine ripened toms). My third cookbook, "Stephen Cooks, Vol III" is near completion. It's mission is to bring interesting, unusual, and always unique things to the attention of other foodies. The word unique is apt because each of these recipes has an aspect that is a special touch. It might be the combination of ingredients, the cooking method, the spicing ... something - anything to keep them from being just everyday, and falling into the category of "everybody's doing it." Let's start with the shrimp. I buy whatever's on sale. 6 or 7 ounces is sufficient for a meal for 2 (that's what I prepare everyday). I'm not fond of leftovers, so I take pains to prepare what my husband, Peter, and I will consume in one sitting. It's tricky - much easier to cook for 4 than for 2. Traditionally ceviche is a method of "cooking" shrimp in the acid of lemons and/or limes. My method includes fresh orange juice, limes, and zest from both. If the shrimp are dropped into simmering water for 30 seconds before being immersed in the juices they will have a nice texture (if they are cooked entirely in the juice, they tend to be a little floppy, whatever that means). 30 minutes marination is sufficient; a couple of hours is fine. The potatoes First they get boiled until not quite cooked through. Then cooled, diced, tossed with olive oil, salt and pepper, and browned up under the broiler for just a few minutes. Caprese salad. No points for creativity here, except possibly for the use of cherry tomatoes. This is pretty traditional: tomato, basil, mozzarella, drizzled with olive oil and sprinkled with a pinch each of salt and pepper. There, I've done it; re-entered the world of the obsessive blogger. I will be back soon. If you view this, please send me a brief note so that I know I'm not alone out there. I'll be visiting the blogs of my followers (there appears to be 20) over the next few days and will be sure to let you know I've been there. Many folks have been reading this and seeing how much of a story it is as opposed to just a compendium of recipes. To order go to http://www.createspace.com/3695950 or to Amazon, where you search for my name, not the title. "Denver is lousy with home-cooking blogs, but one that isn't lousy is The Obsessive Chef, where avid (OK, obsessive) home cook Stephen Crout experiments with and offers tips on recipes from a variety of sources. One recent triumph: succulent, crisp-skinned "Broasted Chicken." 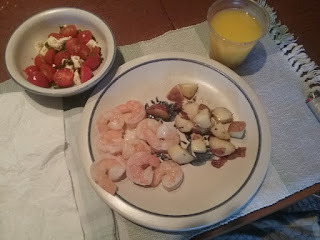 Visit theobsessivechef.blogspot.com for that recipe and dozens more."